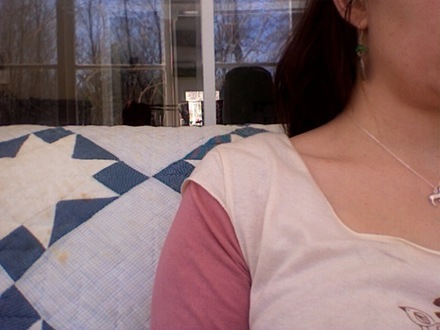 So here I am right now (view above from the laptop - we love PhotoBooth), writing this post from our sun porch. This is my very first 'sit' of the year, and I'm quite excited about that. Adelaide is napping, Calvin is at a class, and Ezra-a little bit feverish- is on the floor drawing (astronauts). Luka is sitting in the sunniest spot, soaking it in. And so are we - soaking it in. There are piles and piles of snow outside, but the sun is lovely (Tomorrow really is March! ), and I'm blissfully ignoring the piles of skiis and skates all around me. The wireless connection in this spot of the house is rather slow, but that feels just about right for the moment. Slow. Quiet. Most of my posts are written at night - in the quiet moments after the babes are asleep, but before I begin the 'rest' of my evening. The time I spend writing them is one of my favorite times of reflection and thinking. I don't think of this as a 'journal', and am in fact, quite mindful about what I say - it isn't "all" of me or us, and I think most of you understand that. I edit my photos at night too, which includes a viewing session of all the 'family' photos I've taken during the day, usually resulting in much laughter and telling of the day's stories to Steve. (Even when the kids are sleeping, we still can't stop talking/thinking about them, can we?) And then, in the morning, I 'publish' the posts to the blog. I like the habit of it all, the ritual, the rhythm. And I'm so happy to hear after yesterday that many of you enjoy and appreciate that as well. I'm feeling rather speechless today (well, judging by the length of this post already, perhaps that's not the right word). A little stunned, very humbled, a little shy, actually, and quite moved. You are all sooo nice. Really, it was such a pleasure for me to read snippets of your day and lives - I'm so grateful for how much you shared. I'm struck by the diversity amongst us - the many places in the world in which we live, not to mention the places in our lives in which we're at. So very different, and yet there's always a connection, always something - some thread that binds one person to another. Amazing. I usually read through comments at the end of the day with a cup of tea or glass of wine. But yesterday, the joyous experience required a few refills. I was quite choked up reading every single comment. And I did my best to resist the compulsive urge to respond to each - to continue the conversation. But, alas, sleeping is important too (though Adelaide doesn't believe me on that one yet). We have some winners! We'll assume my first count was spot on. 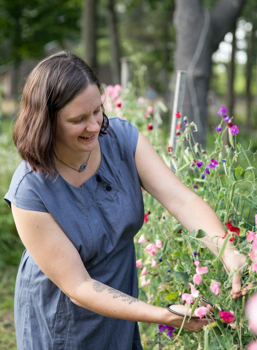 I'm cooking up a little something for each of you - look for an email from me today! There's a little update in the Etsy shop today. Some market totes, a couple of smocks, and these new sets that I'm very excited about. They've been my first birthday/baby shower gift of the season. 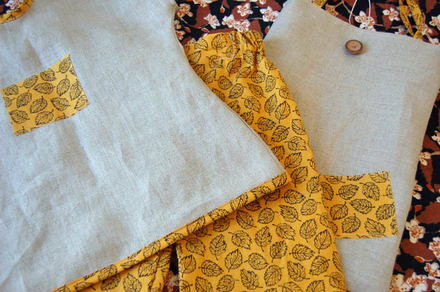 A linen smock, elastic waist pants, and a coordinating linen bag to hold all the goodness for mama or baby. Making these just makes me smile, and I hope you will like them too. There will be another update next Tuesday. I'm still blushing a bit. And I talk too much when I'm flustered (clearly), so I'm going to stop now and say Thank You!